Childhood stories have the ubiquitous quality of being easy to read out loud–it is even encouraged, in most cases. 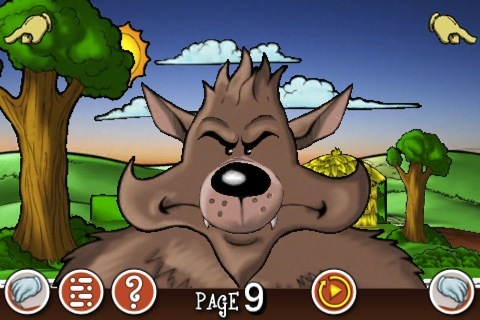 The story of the three little pigs and the big, bad wolf is perhaps the one that most lends itself to this attribute, and Coleco Entertainment has taken this classic and done you one better. In their freshly released book app, 3 Little Pigs, not only do you get the voices, but you also have interactive pop-up illustrations to play with. There are two modes to this book: Animation Mode and Interactive Mode. In Animation Mode, the story is read to you as you follow along; Interactive Mode allows you experience each page by touch. Rather than giving you a choice between the two, the app seems to switch off, going from Animation Mode to Interactive Mode as soon as you hit a new page. There are over 100 interactive animations in the book, so be sure to explore all the pages thoroughly. Each word in the text that appears is highlighted while the story is read to you, and you can fast-forward the reading to get to the Interactive Mode by tapping on the red button with two arrowheads. Tap the red button with the circling arrow to replay the Animation Mode portion of the page. Tap everything else in Interactive Mode to see all kinds of movement and sound effects; if you’re on a device with a built-in microphone, be sure to follow instructions when the narrator proclaims “blow the house down!” Once you’re satisfied, you can turn the page by tapping on the bottom buttons (with a pointing finger), or by swiping your finger across the screen. 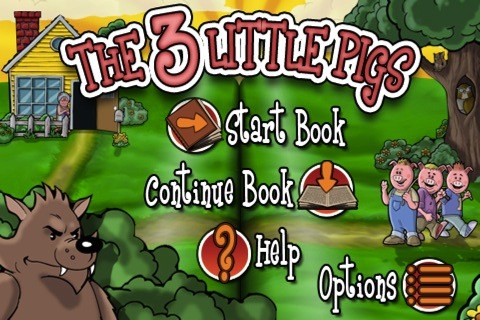 As a book, 3 Little Pigs would probably be more impressive on an iPad. On an iPod Touch, the effect is a bit muted (and the app kept crashing on mine, but it doesn’t seem to be a universal bug, judging from the rest of the comments). The most prominent features of this app are the pop-ups, as there is little by way of text–in fact, you can even turn them off in the Options menu. The emphasis seems to be on entertainment, not education, and as such the musical score, voice acting, and sound effects are top notch. The design of this app is a little too busy for my taste, but perhaps it is better suited for the younger eyes of its target audience. This app would be an excellent pastime for them, as the rich detail and plentiful activities will take some time to get through. What it lacks in elegance, it makes up for with an abundance of fun. The price, at $4.99, is a bit steep (you could probably just buy a physical book), so you’ll have to decide for yourself whether your child will make the most of it. AppSafari review of 3 Little Pigs – Pop Up Adventure was written by Julie Guan on January 21st, 2011 and categorized under App Store, Books, Fun, Reading. Page viewed 4233 times, 1 so far today. Need help on using these apps? Please read the Help Page.